Luxuriously thick and superbly soft, these 600g combed hotel cotton towels are woven from the finest grade 100% Turkish pure cotton yarns. The 600g weight makes it an excellent drying hotel bathroom towel whilst the luxurious deep pile ensures the towels stay soft and absorbent after every wash. These luxury hotels towels offer a lavishly exclusive feel to any hotel bathroom. 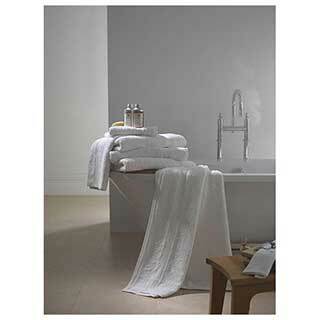 Luxury quality 100% cotton 600g hotel towels. Woven from the highest quality 100% cotton with a wonderful deep pile, they are incredibly soft and super absorbent with a stylish rib border. The ultimate in softness and comfort. Mercerised header to prevent shrinkage. 100% cotton. Available in white only. Available in 3 sizes - Hand Towel 50/100cm (20/39"), Bath Towel 70/135cm (27/53") and Bath Sheet 100/170cm (39/67").